Demi and Kyle’s rustic Sarasota wedding featured an outdoor ceremony with a bright color palette. 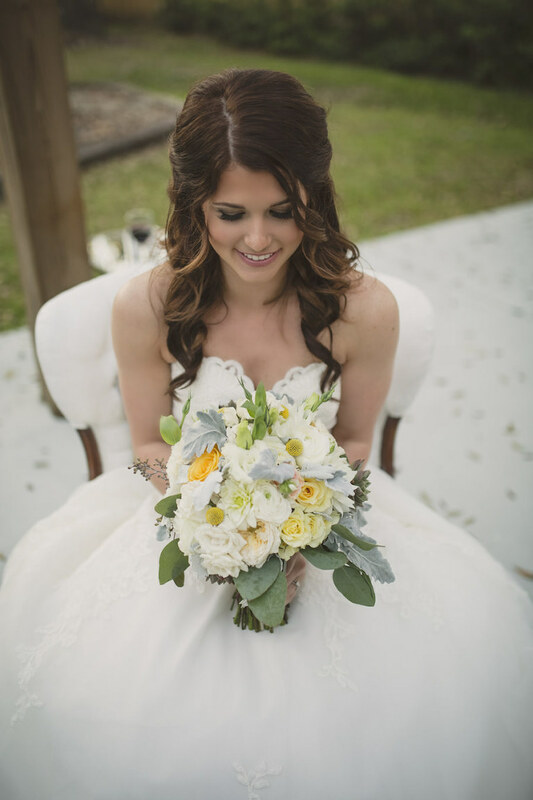 With guidance from their Sarasota wedding florist, the bride and groom complemented their rustic wedding with white and yellow roses and natural greenery elements. The couple’s wedding menu was a top priority, and they searched for a Sarasota wedding caterer who could deliver a quality, restaurant menu. The bride and groom focused on their creating a memorable Sarasota wedding ceremony, complete with personalized vows. 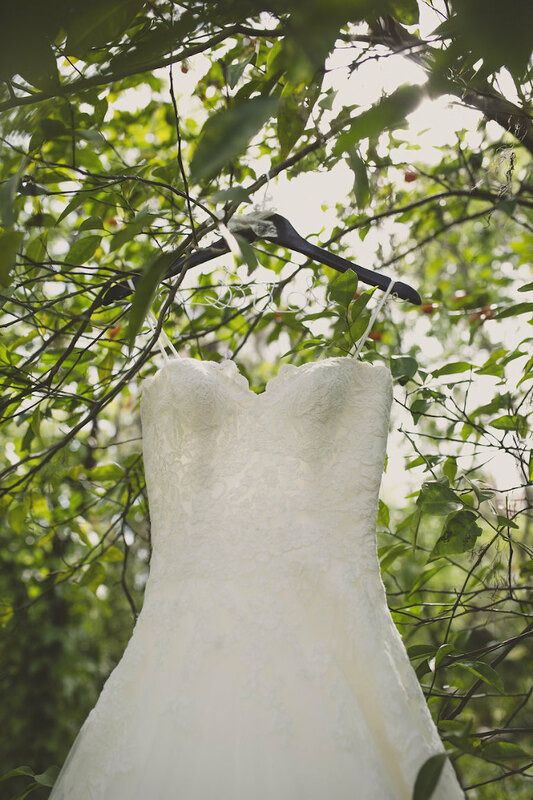 Looking back, one of the bride’s most memorable moments was seeing her soon-t0-be husband for the first time. “Seeing Kyle when coming down the aisle is memory I’ll never forget. As I walked out the doors and could finally see him, my heart just exploded,” Demi reminisced. The theme was “spring, rustic chic.” The location had a rustic feel, outdoors with lush greenery and a barn style building. 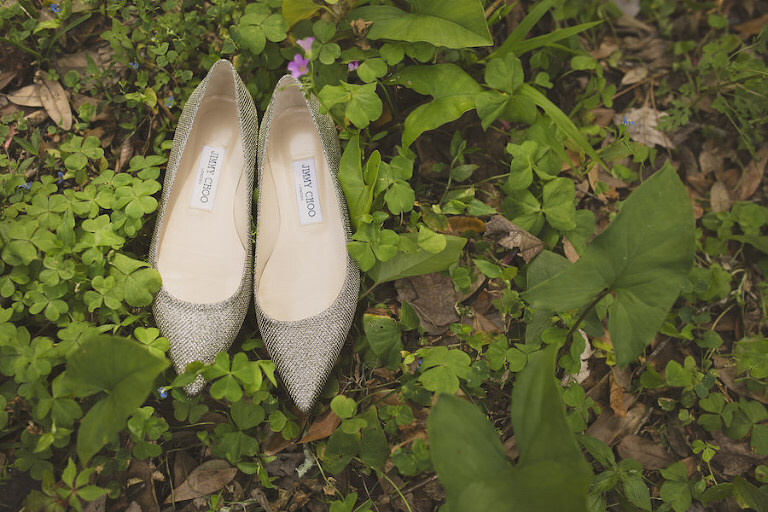 We had tons of spring colors and flowers thanks to our amazing wedding planner! Yellow and shades of grey. 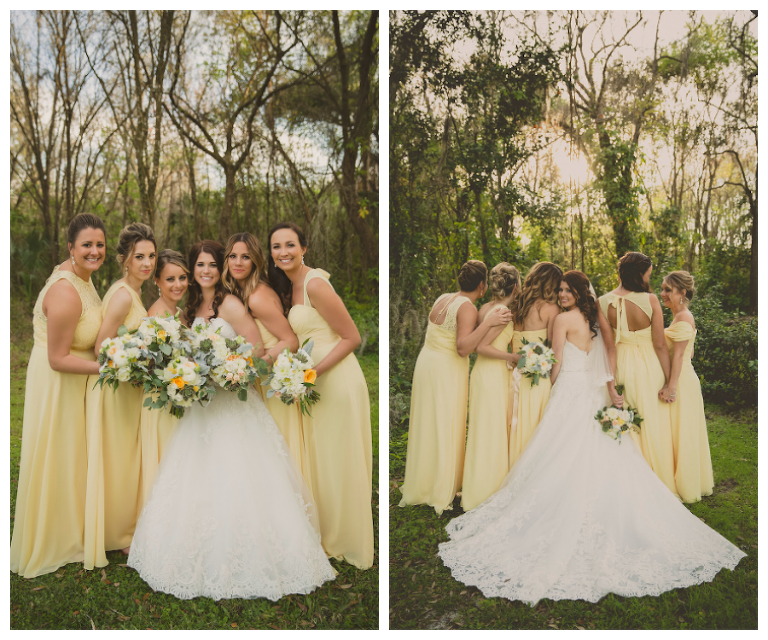 We always wanted a spring wedding and thought that yellow was the perfect color to complement the season, especially because our venue was so lush and green. The yellows really popped. Kyle proposed at my absolute favorite location in our hometown of Sarasota, the Ca’ D’Zan mansion at Ringling. I had been wanting to take him there, and he finally asked to take me one weekend. It took years to get him there, then out of the blue he was dying to go! We got there right as the doors opened. It was the most amazing, memorable moment on the steps overlooking the Sarasota Bay. I had spoken with a few florists and really wanted someone who seemed to get my vision and could run with it naturally. I love the look of floral arrangements and wanted them to be a bigger part of the wedding, but really had no knowledge of flowers. My planner and I sent over a vision sheet with some pictures and we gave Andrea [of Andrea Layne Floral Design ] a brief explanation of what I was looking for. She instantly ran with all of our ideas and turned them into something seriously amazing. You can tell Andrea has a passion for what she does, and she seemed genuinely excited to work with us! She also was super helpful with budgeting. She gave lots of options so that I could get exactly what I was looking for, but still stay in budget. I would definitely choose Andrea Layne Floral Design time and time again! What was the inspiration for your menu, and what did you look for in a caterer? We did not want traditional wedding food. We needed great food at the wedding; it wouldn’t feel like our wedding without some amazing food choices! Is it weird to say one of our hobbies is eating? Kyle and I love great food and are constantly in search of the next best restaurant. We wanted a caterer who could deliver a quality, restaurant menu. Kevin and Amy from Good Food Catering were so incredibly helpful from the moment we first contacted them. Kevin was diligent in finding the right menu to suit our tastes, yet stay within our budget. Our tasting was a great experience and not one that I had expected due to prior tastings. One bite of the first appetizer and we both knew this was it. The bahn mi tacos, glazed bacon wrapped shrimp, chicken and waffle bites and steak and gorgonzola quesadillas were the perfect start to our cocktail hour. Don’t even get me started on the shrimp and grits…amazing! Our guests are still raving about the food, which really makes us so happy. The service was perfect: a seamless buffet line, friendly wait staff and the best event manager. Things ran smoothly from start to finish! I would advise other couples to stay true to what you and your husband want. It can be easy to let everyone else’s opinions take over. Just do what feels right and everything will turn out great. There are no rules. Have fun planning! I had so many people tell me planning would be a nightmare and cause fights between Kyle and myself. This absolutely does not have to be the case. We genuinely had fun planning the whole time. Of course, we had a few freak out moments here and there when all the bills were due, but we knew it would all be worth it in the end. Make sure you have a photographer and videographer who you trust and love their style. The photos and wedding video will be something we treasure forever.